YEREVAN – On March 26 the US Ambassador to Armenia Marie L. Yovanovitch, the President of Diplomatic Spouses Association Nani Oskanian, Armenian Marriott hotel personel, as well as Governor of Armavir marz Ashot Ghahramanyan and National Assembly Member Hrant Grigoryan joined Fuller Center for Housing Armenia to participate in a home-blessing ceremony in Haytagh village, Armavir marz. Last July, Ambassador Yovanovitch joined the Arshakyan family as a volunteer to help with floor concrete works along with US Embassy personel and Global Builders volunteer team from the USA. Today, after a ten-year wait, the Arshakyans moved to their newly built house and were willing to share their happiness with those who supported them on the difficult path to overcome homelessness. 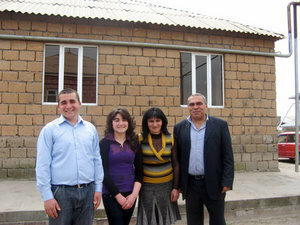 Volunteer with FCH Armenia on a Global Builders trip this summer! Learn more about FCH Armenia on their Web page.